Yeon and her mother are happily walking through the woods and Yeon asks San Daek if they will be getting on a ship. San Daek says yes, making Yeon who loves boats happy. Yeon pauses as her ears pick up the sound of hoof beats (not even her mom picked that up). Yeon says someone is coming and this worries San Daek and the two begin running. Lord Yoon is in hot pursuit. He catches sight of them and keeps racing towards them only to lose them in a crowd. When he catches sight of them again, he becomes reluctant to chase after them. Seems he doesn’t really want to take that little girl’s life just to save Cho Ok. When his men catch up, he tells them to head back and leave the mother and daughter alone. Yoon goes to visit the shaman and asks what will happen if he finds the child only to let her go. The shaman deduces that Yoon has managed to find the girl born on the same day, in the same year, at the same time as Cho Ok. The shaman says that Cho Ok will die and Yoon says that human life is precious. How can he take the life of a little girl to save his precious daughter’s life? The shaman wants to know if Yoon will allow his lust for San Daek to lead to his daughter’s death. He then makes a comment about Yoon not knowing the whole truth. Does the shaman know that Yeon is a gumiho? I don’t know, they don’t tell you just what it is that the shaman knows and Yoon doesn’t. It’s rather annoying. San Daek and Yeon caught! Meanwhile, Yoon’s servant goes to the police (whose chief is already angry that Yoon stood in his way of capturing the mother and child earlier) and tells them that the mother and daughter have left Yoon’s house and are fleeing. I think he acted on his own to help ensure that Lady Cho Ok is saved. The brat isn’t worth saving if you ask me. The police immediately set out after Yeon and her mother. They begin running again when they see their pursuers. They head towards the woods where Yeon keeps falling and eventually hurts herself. Knowing that her daughter can’t keep running, San Daek hides her and goes off alone. Yeon stays put and keeps her mouth covered, trying to be silent. The bell her mom gave her jingles, alerting soldiers to her presence. They draw their swords and surround her, demanding to know where her mother is. San Daek’s eyes flash, ears get pointy, and hands get furry. But when she returns to the ground, she is completely human looking again. She puts her arms around Yeon and declares that she is the girl’s mother. Yoon and his wife are sitting by Cho Ok’s bedside and Yoon apologizes. Lady Yang wants to know what for, but Yoon will not say. Besides the fact he let Cho Ok’s potential savior go, he is also sworn to secrecy by the shaman who told him that before Cho Ok’s 10th birthday and the day of the ritual, no one must know about Yeon’s pupose. His servant (the one who turned San Daek and Yeon in) comes and tells him that the mother and daughter have been caught by the police. This alarms Yoon who sets off to save them (if Yeon dies, then there is no hope for Cho Ok). At the police station, San Daek is being beaten, but refuses to tell where she got the jade from. Not liking her attitude, the chief decides to beat Yeon instead. San Daek begs them to keep beating her, but they take Yeon anyways. The chief asks what Yeon knows and she replies nothing (she really doesn’t). The chief doesn’t believe this and has his men start beating Yeon making San Daek start transforming. In storms Yoon who cannot believe that they are beating a child. He puts a stop to it and gets mother and daughter released without charges. When they get back to the Yoon household, Yoon asks to speak to San Daek privately. She sends Yeon off and listens to Yoon’s proposal to stay on and take care of Cho Ok. San Daek doesn’t wish to live among humans and initially turns down the offer, but Yoon says even though this theft matter has been resolved, two females traveling alone will most likely meet the same problem. Wanting to protect Yeon to the best of her ability until Yeon transforms, San Daek reluctantly agrees. Yoon’s wife, mistress, and children are all shocked when he brings San Daek and Yeon in saying that they will be staying from now on so that San Daek can treat Cho Ok. Not a single family member looks pleased by this announcement. 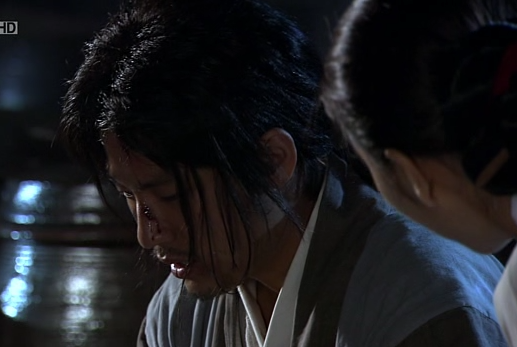 San Daek takes Yeon to their room where she washes Yeon’s wounds and applies medicine. Yeon asks if they have to say and San Daek says it is the best option right now as Yeon will have a roof over her head and three meals a day (which is what Yeon says her father said happiness was – a roof and food for his wife and daughter). Yoon stands outside of their room, tears in his eyes. He doesn’t want to kill the little girl, but he says it is her fate to save Cho Ok. Which might be true given the fact that coincidences keep binding the two together. San Daek makes medicine for Cho Ok and takes it to the little girl who does not wish to drink it. Yeon follows closely, clinging to her mother. Cho Ok says it smells. Lady Yang smells the medicine and says there is no stench. Cho Ok then says that Yeon smells and she doesn’t want her to be there. San Daek doesn’t like this, but sends Yeon out and Cho Ok starts drinking. She stops after a swallow and wants to know if she really has to drink such medicine. Lady Yang says that all medicine is bitter and that Cho Ok needs to drink it down. I hate that child. She is evil. Evil, I say. Why anyone would want to pamper her, I don’t know. Meanwhile, Yeon is outside drawing when Yoon walks by and stops to stare at her impressive artwork. Yeon jumps up guiltily and says that she will get to work right away. Yoon tells Yeon that it is okay, she can continue drawing as she is not a servant. This confuses Yeon, but she is happy that Yoon gave her drawing such high praise. Little Yeon continues drawing happily when Choong Il and Yi come to have a little fun. Choong Il asks Yeon why she isn’t working as she is a servant. Yeon tells him that Lord Yoon told her that she is not a servant and therefore doesn’t have to work. Choong Il calls her a thief. Yeon heatedly says that she is not and Choong Il says that anyone who is fed and housed who doesn’t work for it is a thief (then doesn’t that make him one, too?). Yeon asks what she needs to do and Choong Il tells her to fill these giant urns all full of water. Yeon looks at them and is not happy with the daunting task. As she is bringing back a small jug full, a male servant comes and tries to take it from her. Yeon tells him that she is all right and that she will do it herself. The man says nothing and makes motions that he will carry. Yeon asks if he is mute and he nods. She then asks if he can understand her, he nods again. She reiterates that she can take care of the water herself. The servant, Chun Woo (Suh Joon Young) grabs the water jar and begins walking while Yeon protests. Seeing that Yeon is getting help, Choong Il throws a rock at the jar, shattering it. Yeon immediately says it is all her fault, but Chun Woo insists that it was his doing. Choong Il tells Chun Woo to stop protecting Yeon, but he stands in front of her. Choong Il then throws a bottle of ink on the poor girl and is caught by his father. Yoon is outraged by what Choong Il (and his little follower Choong Yi) have done to Yeon. He beats Choong Il with a stick on the calves (a favorite form of punishment it seems – for me it was always a good spanking). 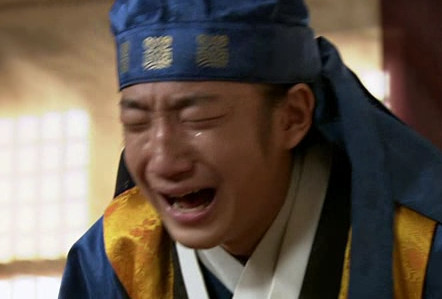 Choong Il’s mother and brother watch helplessly, but it is San Daek who pleads with Yoon to stop, but Yoon refuses to listen to San Daek, his mistress, or his bawling son. Late, San Daek is cleaning Yeon up and changing her clothes and she notices that Yeon’s wounds have almost completely healed (anything to do with her foxiness?). Yeon then asks if they will be leaving some day. Yeon neither hates not likes living at that place, but Yoon (despite his goodness) scares her. Not to mention you of the Choong boys and everyone else looking down on them. San Daek tells Yeon to bear with it as things will be getting better soon (meaning for San Daek that as soon as her daughter turns 10, they are splitting). There is a knock on the door and Steward Oh delivers a package from Yoon for Yeon. It is a professional drawing set – complete with ink, grinder, brushes, and paper. This makes Yeon happy and she forgets about her reluctance to stay for a little while. Later that night, Choong Il, who is angry at being beaten, brutally beats Chun Woo since he cannot harm Yeon without repercussions. Choong Il tells Chun Woo that if he involves himself with Yeon again, Choong Il will kill him. How did his parents managed to raise to psychopathic children (him and Cho Ok, Choong Yi is just a chubby idiot and follower)? San Daek happens to pass by and sees the injured Chun Woo. She immediately asks if he is all right and begins trying to tend his wounds. He waves her away. She gives him her handkerchief and thanks him for helping Yeon, but also warns him from doing so again in the future (probably knows he was beaten because of this and doesn’t want him to be hurt for helping Yeon). San Daek then leaves and Chun Woo tightly clasps her handkerchief. Looks like Chun Woo likes both mother and daughter. Ironically enough, since Chun Woo is mute, he would have been able to keep San Daek’s 10-year secret. The next day Cho Ok receives the same present that Yeon received the previous day. Cho Ok is upset that it is not a game and wonders what she will do with the paint set. Her maid suggests writing to the young master Jo Jung Kyu – a nobleman’s son that Cho Ok has a crush on. Cho Ok sets about writing a very mushy love letter to the young boy. Constantly scolding and berating her maid in between writing it. Why the maid takes it so lightly I do not know. How many people can be blind to Cho Ok’s true nature? Jung Kyu (Lee Min Ho) asks his servant what he is reading. 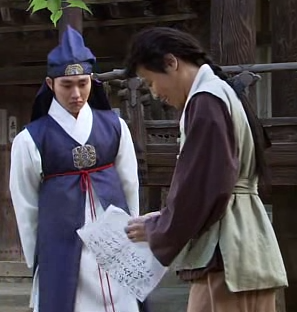 His servant was tittering away at Cho Ok’s love letter and couldn’t believe what it said. Jung Kyu doesn’t seem too thrilled about the letter. You can tell he more than likely doesn’t feel anything for the spoilt, bratty Cho Ok. When the maid returns, Cho Ok asks for her reply. The maid said that Jung Kyu did not send on. This upsets Cho Ok, but the maid mollifies her by saying Jung Kyu’s servant mentioned firefly viewing, so perhaps that was the young master asking Cho Ok to view them too. This makes little Cho Ok delighted. Night has fallen and Yeon is sitting on the porch looking at the sky when she happens to see a firefly. She immediately starts chasing it like she did the butterfly in episode one. She keeps getting further and further from the Yoon household until she finds a field full of fireflies. And, as you may have guessed, that is where Jung Kyu is waiting for Cho Ok behind a stand of trees. Yeon’s bell rings and Jung Kyu sees her happily prancing about trying to capture fireflies. He is immediately enamored with the little girl. His servant comes and asks him about changing spots when Jung Kyu dismisses him. He asks his master why, but when he sees Yeon, he just smiles and takes his leave. Jung Kyu leaves the woods and goes to a bridge. He clears his throat and says that he heard poor people read by the light of fireflies. He then cockily goes to cross the bridge when he slips and falls. So much for a cool entrance. Yeon rushes over to help him and offers her hand. Jung Kyu says the separation of male and female must be maintained. Yeon tells him that such a division doesn’t matter in that situation. Jung Kyu then takes her hand and lets her help him up. The two then go about catching fireflies until Cho Ok comes. Hearing her arrival, Yeon quickly grabs Jung Kyu’s hand and pulls him under the bridge to hide until the two pass. Jung Kyu asks why and Yeon says it felt like they should hide. She then gets up to leave and Jung Kyu hands her the capsule of fireflies. After she is gone, Jung Kyu notices her bell charm and picks it up. On her way home, Yeon runs into the exorcist and loses the fireflies. She apologizes and runs away after noticing his sword. After she leaves, his swords begins shaking. Uh-oh, not a good sign. Yeon tells her mother that she lost the charm and her mom says that they will go to the river tomorrow to look for it. Later that night, Yoon spies on San Daek while she bathes and this is witnessed by Lady Yang. Again, not good. The next day, Cho Ok is unhappily beheading flowers when the maid arrives to tell her that Jung Kyu was there to see her. This cheers the depressed Cho Ok up and she rushes out to meet him. Meanwhile, he takes the bell out of its pouch and smiles. Yeon, who was picking up the flowers Cho Ok tore off, hears the bell and happily runs to find it. Cho Ok asks if Jung Kyu came to see her because he was worried about her health and you can tell Jung Kyu was not there to see her at all. He asks if she knows a wide-eyed, pale girl. Cho Ok pretends not to know, but then up runs Yeon who smiles happily (not because Jung Kyu is there, but because he has her bell). Jung Kyu then says he will talk to Cho Ok later and gives Yeon her bell back. This infuriates Cho Ok who storms off. Yeon thanks Jung Kyu for bringing the bell because she was going to go look for it later. He then notices the bedraggled flowers and asks why she picked them before they were ready. Yeon states that it wasn’t her and that she couldn’t stand seeing them look so pathetic. Jung Kyu then takes her and the flowers and the two plant them together, having a great time. The maid tries to get information out of Cho Ok about her meeting with Jung Kyu, but Cho Ok ignores her and stays huddled under the covers. She then pops up and says she won’t let the girl get away with it. Cho Ok storms off to find Yeon and is shocked to see her father with his arm around her, helping her grind ink. Cho Ok goes to Lady Yang and demands that her mother chase San Daek and Yeon out. Lady Yang says she is uneasy and understands how Cho Ok feels, but they are there to help Cho Ok. Cho Ok then says that if her mother won’t do anything, she will chase them out herself. She corners Yeon and calls her a thief. Yeon insists that it was a gift, but Cho Ok says its impossible and no one would believe her anyways. She tells her maid to grab Yeon to be punished. The maid doesn’t look happy about this, but she grabs Yeon. Cho Ok then leads them to the well and tells the maid to throw Yeon in. Yeon pleads for the maid not to listen, but the maid caves into Cho Ok’s demands and Yeon begins screaming for her mother. San Daek hears the screams and begins running. Yeon is dropped in the well and Cho Ok happily tells her that she will watch until Yeon is dead. Yeon cannot surface as her dress as snagged on one of the stones. Chun Woo beats on Yoon’s door and Yoon asks what the matter is and then takes off running. By the time San Daek gets there, Cho Ok tells her that Yeon is dead. Cho Ok looks down the well and sees Yeon (whose foxiness is coming out). Once Yeon sees her mother, she reverts back to human form. Chun Woo ties a rope around his waist and jumps into the well, pulling Yeon out. Lord Yoon is furious and scolds Cho Ok. He tells her that due to her health he pampered her, but now she is a spoiled brat who needs to be taught a lesson. He begins beating Cho Ok like he did Choong Il earlier. Yes, the girl deserves a beating. She was willingly and maliciously going to kill another person! Cho Ok says that she hates Yeon and San Daek and that she wants them gone. She would rather die than have them there taking care of her. She storms off and Lady Yang yells at her husband for becoming obsessed with San Daek and her daughter to the extend that he beats his own children. They don’t understand the whole situation so they have no idea why Yoon is so angry (though it is partly because he does like both Yeon and her mother). San Daek takes Yeon and tells her that they will leave at dawn because she hates this place and what the people are doing to her daughter. Yeon says its not too bad because there are kind people like Yoon and like Jung Kyu (but she doesn’t mention him to her mother). They are then requested to go meet Yoon who is sitting in a house sharpening a sword. It’s too early to kill Yeon, right? My thoughts: Well, I’ll take back Seo Shin Ae not being the best actress as she has made me completely hate her character. Cho Ok is a spoiled, crazy brat who deserves her curse. She thinks the world revolves around her and that everyone needs to jump to her every whim. Grr. I love Chun Woo’s character. He selflessly jumps in to defend Yeon and even goes to tell Yoon when the well incident happens. I really like the young Lee Min Ho playing Jung Kyu. He is good actor for a young kid and his scenes with Kim Yoo Jung are cute. I can’t wait to see more of them. It doesn’t seem like this drama will do any fast-fowarding, so don’t expect too much of a romance as I think it will just heavily focus on the events leading up to Cho Ok’s and Yeon’s 10 birthdays.